We like to host webinars, and our customers and prospects like to attend them. But when our webinar vendor moved from a pay-per-person pricing model to a pay-per-webinar pricing model, we wanted to find out how to maximize registrations and thereby minimize our costs. Time of day – 11 a.m. or 2 p.m.
Once we'd collected our data, it was time to analyze it and answer some key questions using Minitab Statistical Software. Should we use registrant or attendee counts for the analysis? Our data collection system for webinar registrants is much more accurate than our data collection system for webinar attendees. This is due to customer behavior and their willingness to share contact information, in addition to the automated database processes that connect our webinar vendor data with our own database. So, for a period of time, I manually collected the attendee data directly from our webinar vendor to see how it correlated with the easily-accessible and accurate registration data. The scatterplot above shows the results. 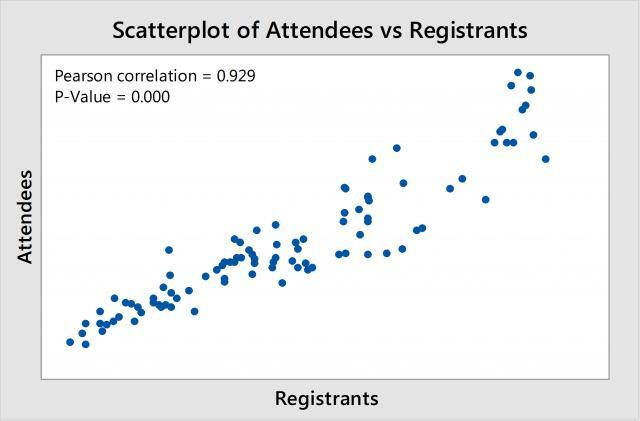 With a correlation coefficient of 0.929 and a p-value of 0.000, there was a strong positive linear relationship between the registrations and attendee counts. If registrations are high, then attendance is also high. If registrations are low, then attendance is also low. I concluded that I could use the registration data—which is both easily accessible and extremely reliable—to conduct my analysis. Should we consider data for the last 6 years? We’ve been collecting webinar data for 6 years, but that doesn’t mean we can treat the last 6 years of data as one homogeneous population. A lot can change in a 6-year time period. Perhaps there was a change in the webinar process that affected registrations. 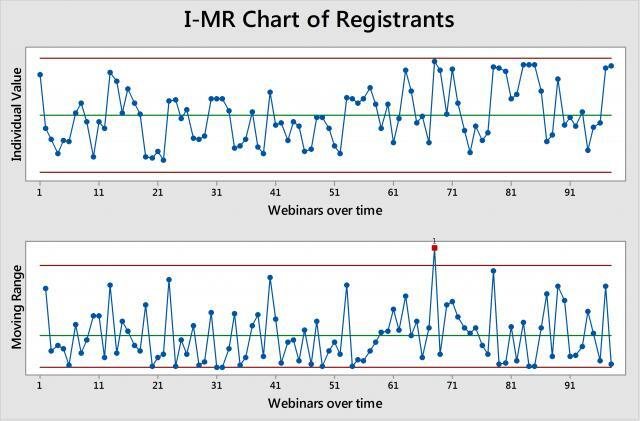 To determine whether or not I should use all of the data, I used an Individuals and Moving Range (I-MR, also referred to as X-MR) control chart to evaluate the process stability of webinar registrations over time. 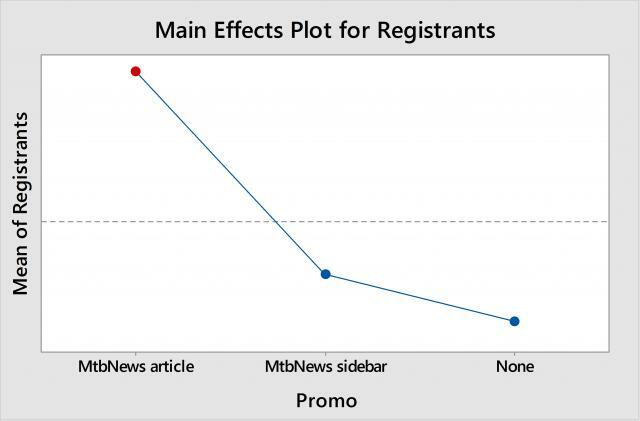 I performed an ANOVA using Minitab's General Linear Model tool to find out which factors—topic, day of week, time of day, or newsletter promotion—significantly affect webinar registrations. The ANOVA results revealed that the day of week, time of day, and webinar topic do not affect webinar registrations, but the newsletter promotion type does (p-value = 0.000). So which webinar promotion type maximizes webinar registrations? 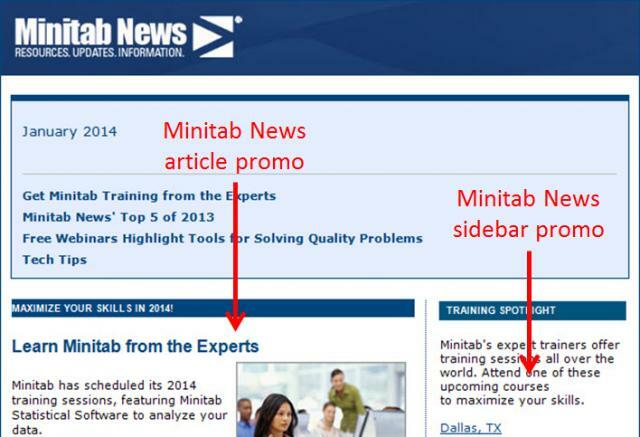 Using Minitab to conduct Tukey comparisons, we can see that registrations for webinars promoted in the newsletter sidebar space were not significantly different from webinars that weren't promoted at all. However, webinars that were promoted in the newsletter article space resulted in significantly more registrations than both the sidebar promotions and no promotions. From this analysis, we concluded that we still had the flexibility to offer webinars at various times and days of the week, and we could continue to vary webinar topics based on customer demand and other factors. To maximize webinar attendance and minimize webinar cost, we needed to focus our efforts on promoting the webinars in our newsletter, utilizing the article space.